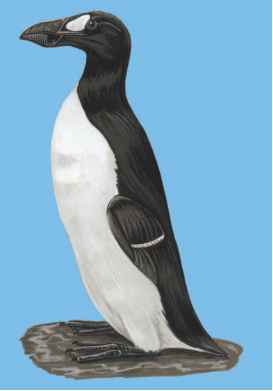 Physical characteristics: Great auks were the largest members of the auk family, measuring 30.5 inches (78 centimeters) in length and 11 pounds (5 kilograms) in weight. They had black heads and backs, black wings, black feet, and white bellies. Geographic range: Great auks were once found in the North Atlantic, between the Arctic Circle, New England, and the British Isles. Habitat: Great auks were found in rocky seashore areas as well as in adjacent open ocean. Diet: Great auks ate mainly fish. Behavior and reproduction: Great auks were unable to fly. They spent the winter primarily at sea. During the breeding season, great auks were found in huge colonies on a small number of islands. Females laid a single egg on bare rock. Eggs had unique markings which likely allowed parents to recognize their own egg. Great auks and people: Great auks were driven to extinction by human hunting. 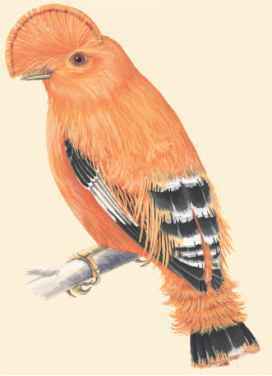 Because they were unable to fly and gathered in large numbers during the breeding season, they were extremely easy to hunt. Their feathers were collected and their bodies were boiled to extract valuable oil. Their eggs were also collected. Fuller, E. The Great Auk. New York: Harry N. Abrams, 1999. "Alcidae (Auks)." The Internet Bird Collection. http://www.hbw.com/ibc/phtml/familia.phtml? idFamilia=69 (accessed on June 8, 2004). "Family Alcidae (Auks)." Animal Diversity Web, The University of Michigan Museum of Zoology. http://animaldiversity.ummz.umich.edu/site/accounts/classification/ Alcidae.html#Alcidae (accessed on June 8, 2004).